Columbus got snookered on a horse deal. On his second voyage in 1493, he meant to bring big, beautiful Andalusians, but what got delivered were smaller, rougher animals, almost ponies. Short on time, he loaded them up anyway and sailed on. Thus began the story of the Native American horse. Columbus's tough little horses were later crossed with Spanish Barbs, Arabians and other Europeans strains and types on breeding farms in the Caribbean. When the Spaniards moved into North America -- where horses had vanished about the same time as the wooly mammoth -- the native peoples were amazed by what they thought were two-headed monsters. As soon as they figured out that man and horse were separate, they set out to acquire what they called "god dogs." By fair means or foul -- trade, capturing runaways or bald thievery -- horse culture spread across the plains until nearly every tribe was mounted. Indiscriminate breeding and natural selection developed a generic smallish horse (13.5 to 15 hands) with a lean but strong body and the ability to survive anywhere on a little water and sparse grass. This multipurpose animal became known as the Indian pony, the cowpony or, since a registry was established in 1961, the Native American horse. Within the designation of Native American horse are some specific types that hark back more closely to their imported ancestors. One of these is the Spanish mustang. 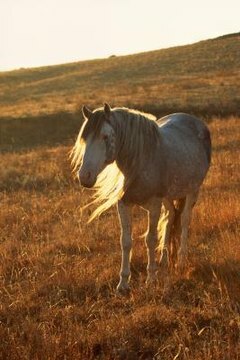 Isolated communities of these feral horses that have not interbred with modern breeds show definite physical resemblance to the Spanish Barb, with its flowing mane and tail and smooth gait. Other Spanish Barb traits include stripes on the legs and down the spine and rare coat colors, including grulla and lilac roan. The Nez Perce of the Pacific Northwest specialized in spotted horses and are believed to be the only tribe to practice selective breeding and develop an actual breed of horse. Their focus was, and still is, on speed and intelligence as well as the distinctive spotted coat. The original Nez Perce-bred strain has all but vanished due to crossbreeding with Arabians and Quarter horses, but the tribe is currently working to revive the foundation type, now known officially as the Nez Perce horse. The true appaloosa may not be the prettiest horse in the herd -- with his big head, upright mane, high withers, striped hooves and mottled muzzle -- but as an all-around athlete and performance horse, he lives up to his wild heritage. A recent addition to breeds accepted into the Native American Horse Registry is a junior version of the appaloosa called the Pony of the Americas. The foundation for this breed was an appaloosa/Arabian mare bred to a Shetland pony stallion. The POA is small (13 to 14 hands), with an Arab head and dished face, and should be more muscular than the true appaloosa. His coat must be visibly appaloosa at 40 feet in any appaloosa pattern from leopard to snow-capped. He's stout enough to carry a lightweight adult, but he's designed specifically for children, so he has a gentle disposition. ThinkQuest: Interesting Facts on Christopher Columbus!